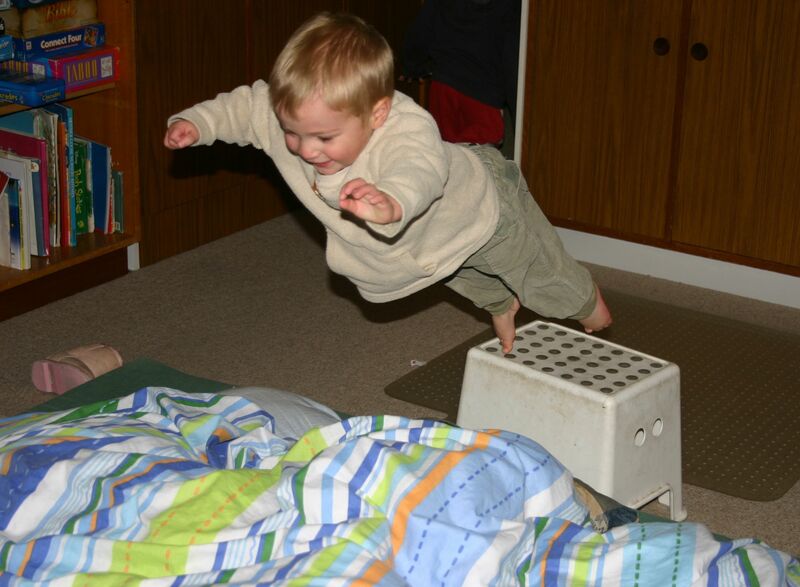 Get the children involved in setting up an indoor obstacle course. Include household items to crawl under, climb over, jump around, hop along, run between and anything else you can think of. Have it ranging throughout the house or in a tight circuit in the one room. 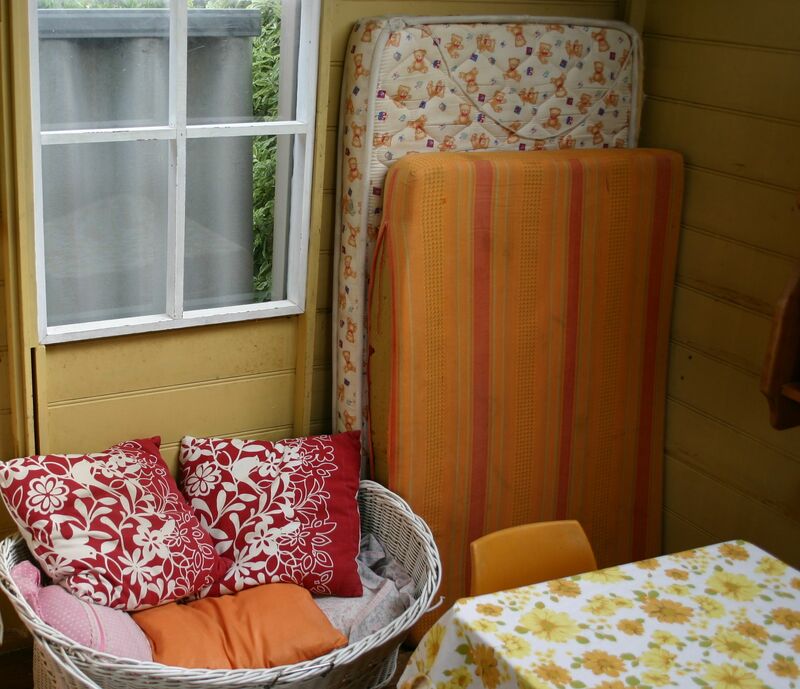 Use cushions, blankets, chairs, tables, broom handles – the list is endless. Cushion stepping-stones through the alligator infested river, commando crawl underneath a heavy blanket or quilt, mountaineer over cushion mountains, leap tall buildings in a single bound (Duplo?) or whatever else you can think of. Building it takes quite a while and is half the fun. Using the super spy pack-up method makes packing away part of the game. We collected every pillow, cushion and doona in the house and made a giant pile on top of two mattresses in the middle of the room. A stable step to leap off was the only other item needed from lots of jumping fun. To avoid jumpers crashing into the previous person we had an entry point (the table) and an exit point (the other side of the room) with a running circuit between the two. Nobody was allowed to backtrack – everyone had to do the full circuit before waiting their turn from under the table again. Everyone going in one direction saves a lot of disasters! Even 11-year-old boys think this kind of family game is cool! Fly is a very old-fashioned game traditionally played outside with nothing but twigs. We used the hallway and our stuffed toys for an indoor version. The little kids didn’t quite get the concept and just ran up and down getting in the way but the older children figured it out fairly quickly. How to play: Spread your teddies (chopsticks, ribbons, cushions or whatever) evenly down the hallway with enough space to step between each item. The first player has to run down the length of the obstacles, stepping only once between each item. If they are successful, they choose one item to remove – not the first or last one though. As more players successfully step only once between each toy and remove one item, the gaps begin to get larger and the game becomes more difficult. The winner is the last person who makes it through before it is no longer possible to do so. Put some great music on the stereo and get down and boogie together. Play statues or musical bobs. Play a safe version of musical chairs using small beanbags or some other soft items scattered about the floor in place of the chairs. We have a CD with set actions that gets everyone moving and I have been told that there are some groovy kids dance videos on YouTube with actions to follow along with. Half an hour to get those wiggles out will make for a much more peaceful time together and build family relationships while you are at it. For a few more ideas, see my Pinterest rainy day pinboard. Enjoy! The oats sensory tub has been an ongoing hit. (See original post here.) I have made a few adjustments in order to eliminate the apparently irresistible urge to set up the equipment and oats on the sheet, rather than in the tub! Propping it up on Ikea steps so that the children can stand and play, rather than kneel on the floor and bend over seems to work better, as does removing all the available play accessories into a large basket so that the children choose what they want to use and place only that into the wooden play tray. I found a mini dustpan and broom to sweep the oats up and put them back into the large bowl at the end of play but this is actually the main attraction right now and is constantly being used to sweep the oats about and shovel them up. 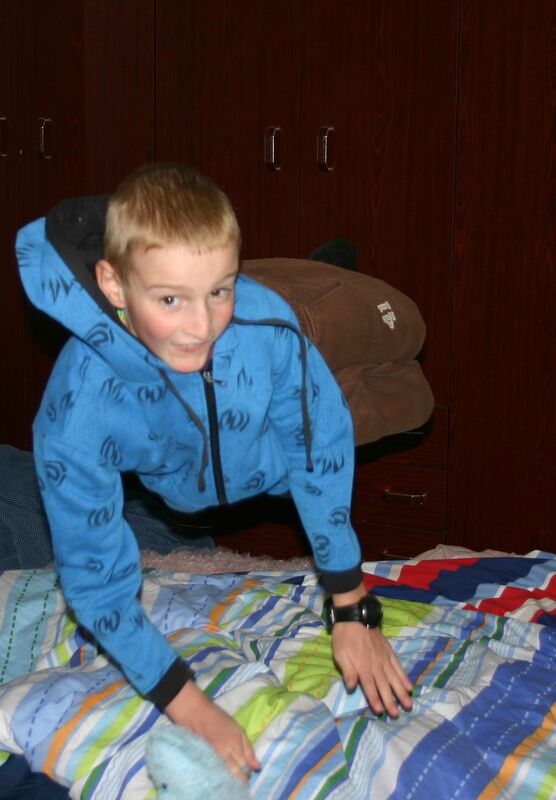 Good training for chore time! I had originally planned to swap out the equipment once a week or so but as we are not using this every day (it is supposed to be our rainy day only activity although the kids love it so much I haven’t stuck to that) and interest is still running high in what is currently out so I’ll leave it for another week or two and add something new when I need to boost enthusiasm for the activity. When our cubby first arrived a number of years ago, it was a big hit. Meals on the verandah were frequent. Two years later a make-over is required. The following ideas will help make our cubby (and yours) an attractive play option this winter. Don’t forget to change the contents occasionally and limit what is available at once. Everything out together will make for one huge mess and actually works against producing worthwhile play. Choose open-ended accessories and toys that promote imagination. How do you know if something is open-ended? Ask yourself what you can do with it. A toy vacuum cleaner can pretty much be used for vacuuming and that’s it, making it a closed toy choice. A pile of sheets can be princess gowns, bedding, room dividers and so on, therefore it is an open-ended play choice. Blackboard and chalk. Buy some blackboard paint and make one whole wall a drawing space. Not a little square mind you – a whole wall. Either paint onto wood and mount across the wall or paint the cubby wall itself if it has a fairly flat wood surface. Screw up a bucket of coloured chalk and a duster and watch the many different ways it will be used. We find that a damp cloth often works better than an actual duster to remove the chalk. 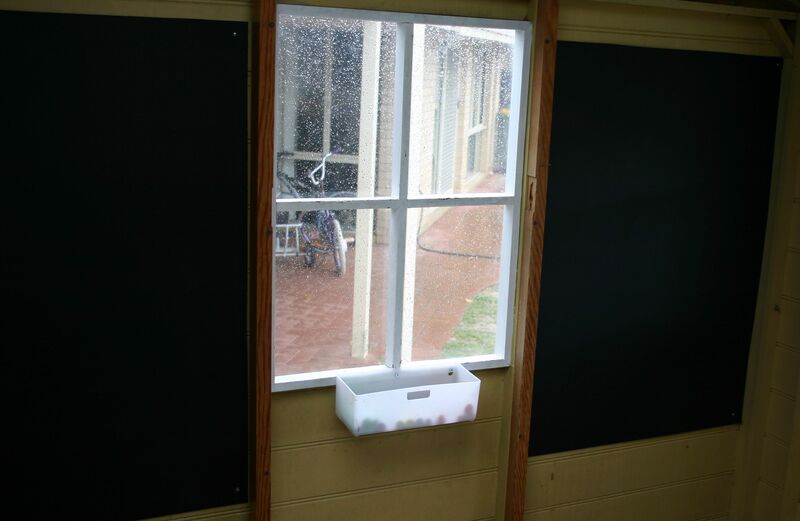 I also hung up two smaller blackboards that can be taken down to serve as menu boards and order tablets etc. Telephone. My Mum loves to tell us about the working field telephone they had when she was young, strung up between the cubby and their house for real two-way conversations. Unfortunately we don’t have this option but a pretend phone is a must. You could add some phone books to look up numbers. 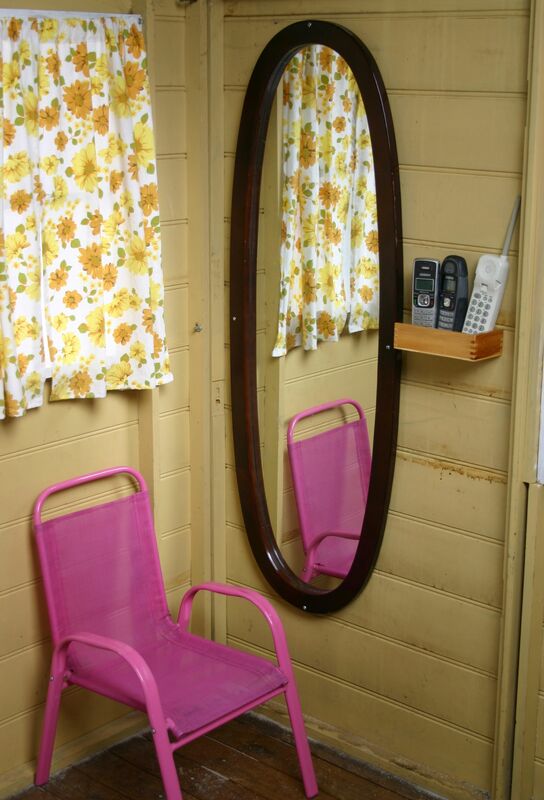 I came across a telephone station idea on the web that had a large mirror behind it. 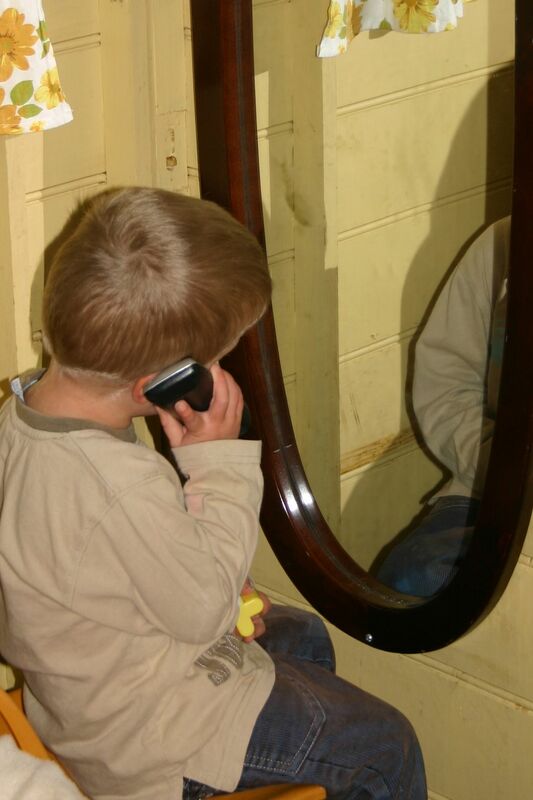 I have never considered a mirror being linked to phone play but apparently children enjoy watching themselves talk on the phone and it is great for language development. It seems to be true because the moment the mirror was up my son grabbed a phone from elsewhere (I hadn’t screwed them on the wall yet), pulled up a chair and sat down to watch himself chatting to imaginary family members. Door bell. Well mannered cubby visitors must learn to knock or ring right? 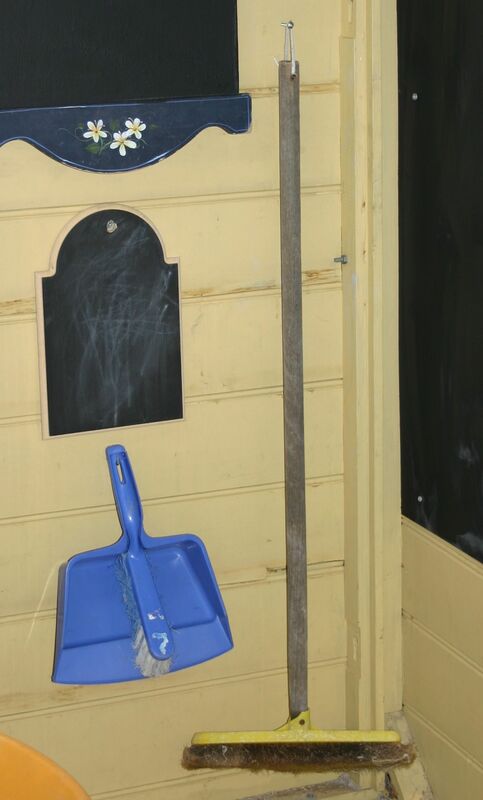 Toddlers and young children will love ringing the bell every time they go in and out. Letterbox. Add some paper, envelopes, drawing equipment, stickers for stamps and a sack to collect and deliver the mail with. Really cool letter boxes are the ones with a little flag to put up to let the children know the mailman has been. If Mum or Dad occasionally stick in a letter the excitement will be huge. Perhaps an invitation to afternoon tea? Curtains. I asked all the children what they would like to have added to the cubby. There were several usable ideas (pictures, letter box and curtains) and other not-so practical ideas (roller shutters, water piped from the gutters to a real tap, a real oven and a working light – there are no electricity points in our backyard.) 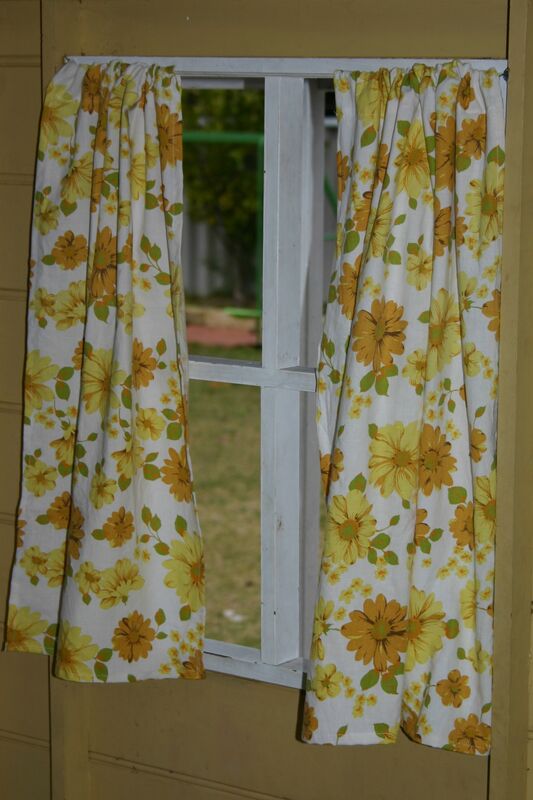 I happily agreed to the curtain idea and sewed some up from an old sheet. A quick hem around each side and double over the end to thread the hanging wire through – about the limit of my sewing skills! Table and chairs. No cubby is complete without a child-sized table and chairs. Activities like the letter writing can be set up on it or use it for the more traditional restaurant, cafe and home kitchen play. There was enough sheet left to make a table-cloth to match the curtains. Pretend cooking equipment. Items such as plates, cups, cutlery, tablecloth, napkins, pots, pans, muffin tins, cake tins, wooden spoons, whisks, egg flips, cutting boards etc. 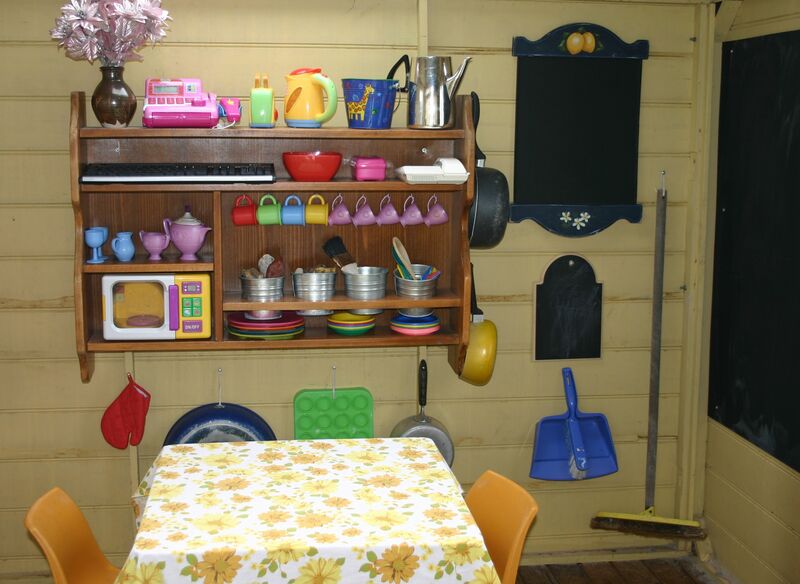 Children love to use real items so use old stuff from your own kitchen or visit the local recycled store for some cheap kitchen gear. While I prefer natural materials such as wood and metal, the reality is that outside these dishes will be covered in sand and water in no time, so I have re-homed some of the many plastic sets people give the children for Christmas and kept my nice natural equipment for pretend play indoors where it will survive for much longer. Small bookcase, kitchenette or shelves. Set them at child’s height and use them to store the cooking equipment. Add some cup hooks and pegs to hang up the pans and what-not. Stove or oven. Even a box turned on its side will do at a pinch. A kid needs somewhere to bake his pies! I have kept ours out on the verandah for extra space and sandy baking projects as the older girls have been complaining that the sand messes up the cubby after they have swept it! Hmmm sounds a lot like my house…. Rocks, pebbles, glass jewels (the kind you add to vases), pieces of natural wood and other such items have unending possibilities for food based play. Avoid plastic pretend food items as these limit play. A plastic pizza is a plastic pizza. An attractive river stone can be a freshly baked bun, biscuit, muffin, piece of meat etc. Child-sized broom. Cut the handle off a regular indoor broom to make it child-sized and hang up a dustpan and brush. You will be surprised at how many times the children choose to sweep out their house. Old sheets, cushions and some kind of bed. We picked up an old cot mattress and a large couch cushion during verge collection in our area that make great bed bases, along with the small decorative cushions for pillows. They are not too big or heavy and can be stored standing up against the cubby wall when not in use. More importantly, there are enough for several children to be “sleeping” at once; very important during hospital play. There is also a very large old-fashioned bassinet that fits the small children very well. Dress-ups and a mirror. I don’t leave my dress-ups outside, but occasionally pop them into the cubby. Dressing up is enjoyed by all but if the children can see themselves in a mirror, the fun triples. While a couple of princess gowns are nice, a pile of old sheets, scarves, hats, shoes, fabric pieces and other accessories allow children so many more play options. Again, a princess dress will usually be used as a princess dress. A fabulous piece of cloth has endless options. Themed pretend-play accessories. Set up a few extras for a doctor’s surgery, shop, restaurant, beauty parlour, pet store or more. See this post for heaps of theme ideas. Water table. (Picture of ours here.) During cool weather, this can be filled with sand or rice or wheat or anything really. Add a few accessories and watch the play develop. 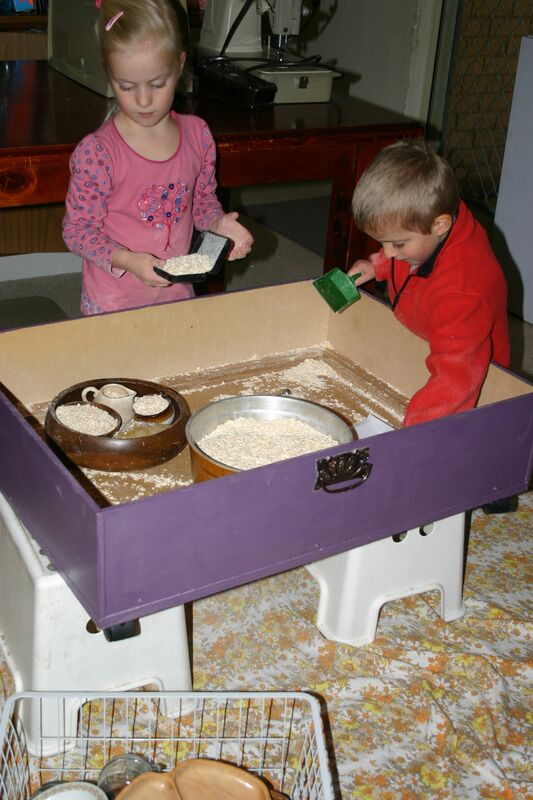 Sensory tubs as they are often known are great for rainy days. 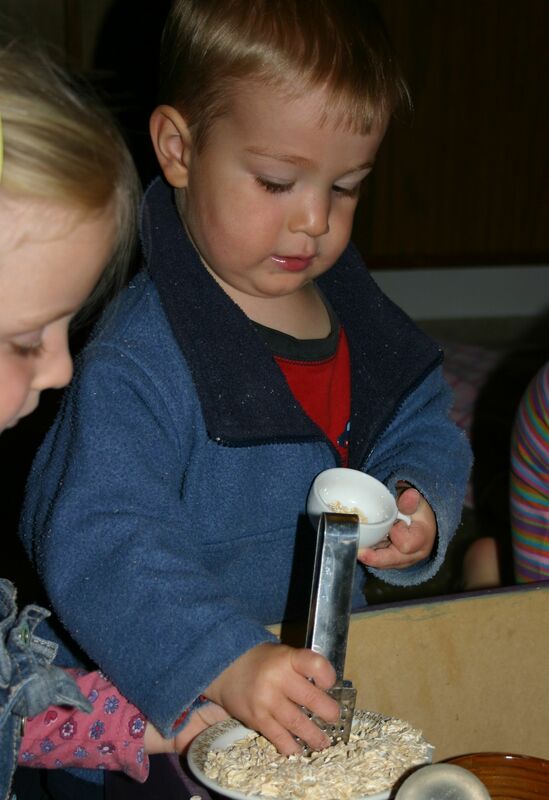 See this post for lots of indoor ideas, or my toddler activities Pinterest page for heaps more. 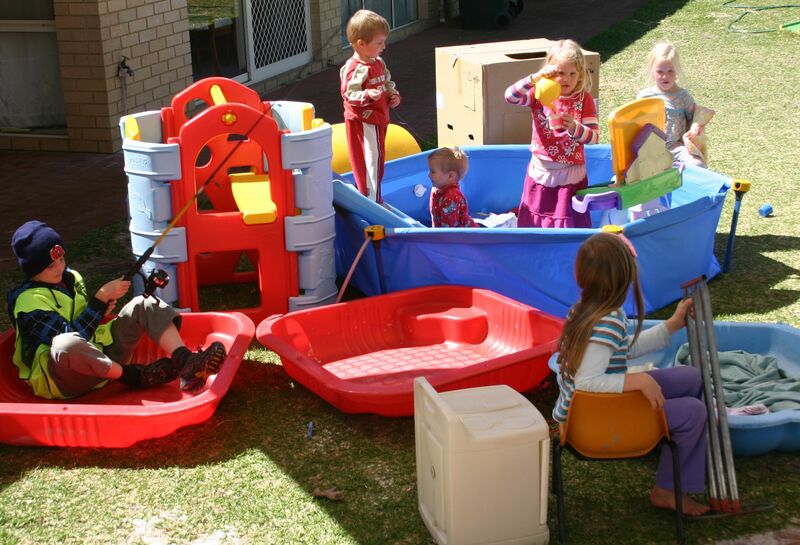 Some of them (the messy ones) lend themselves to outdoor play more than others. 1.Using it as a store-all for all the outdoor toys. You can’t play in a junk pile people! 2. Leaving it empty. A box on legs is still just an empty box and unlike giant cardboard boxes which have endless uses, an empty cubby is just not that much fun. 3. Putting it too far away from the action. 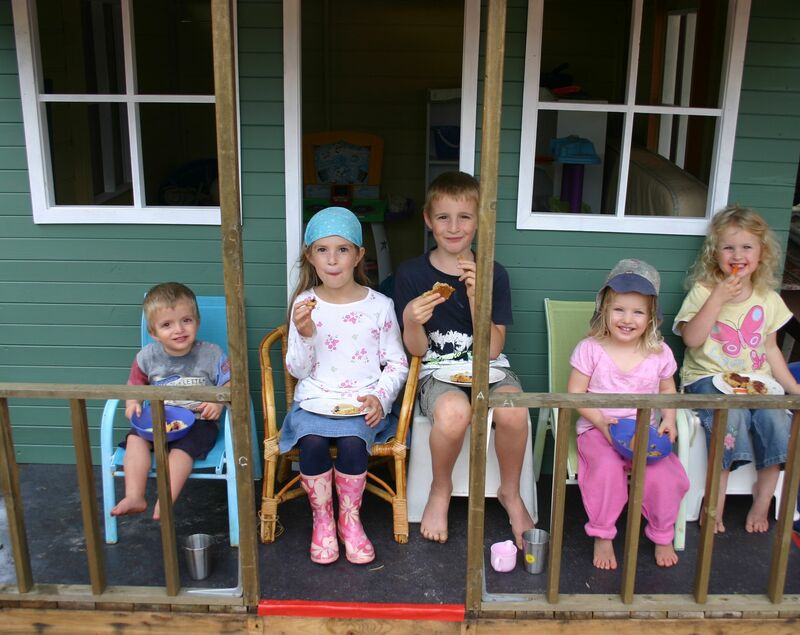 Children occasionally like to hide away but as a general rule, they will be far more likely to consistently use a play house if it is located centrally to the rest of your outdoor area or close to the house. Joined on to a sandpit for example is excellent as the sand then becomes part of the play and opens a whole new dimension of pretend play ideas. Mud pies in the cubby oven are good for hours of entertainment. 4. Small, high windows. For much the same reason as above; children like to be able to pop in and shut a curtain etc. to feel like they have a little privacy but most of the time want to be able to see what is going on and not feel too shut in. Having a good, low window at the front to play shops, serve food through etc. is ideal. 5. Getting hung up about keeping the cubby tidy. It’s not your house or the kid’s bedroom! Let them make some mess. Let them bring in sandpit sand, pebbles from the driveway, leaves or whatever else is making for great pretend play that day. That’s why you include a broom and dustpan! 6. Buying a cubby that is too small. 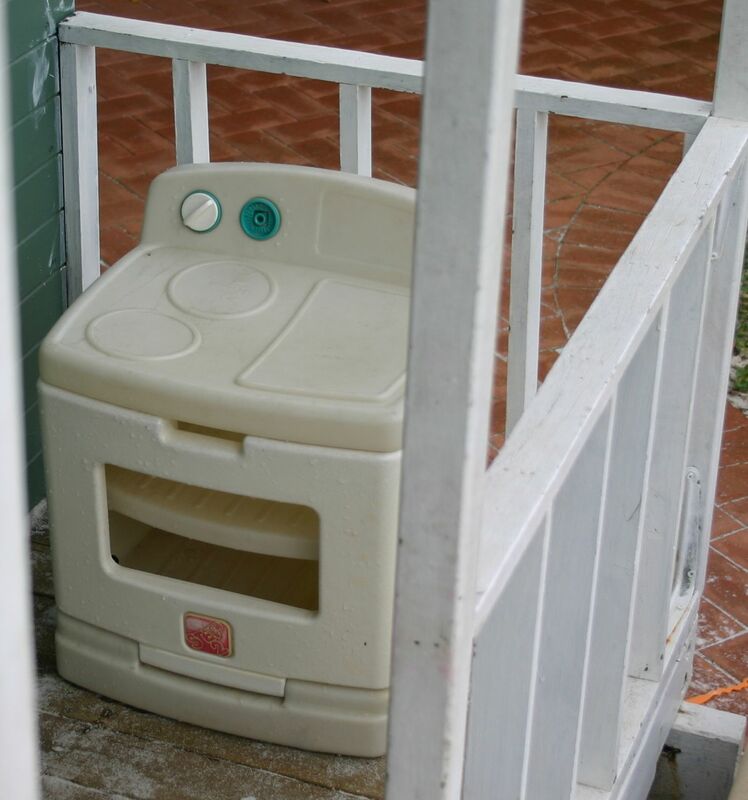 It’s handy if an adult can stand inside but not necessary of course. Think ahead though – if 2 little children fit well, what about when they grow or more children are welcomed to the family? Or when visitors arrive? If you are going to have a well-used cubby, there needs to be space for the mini kitchen, the bed, the blackboard and all the other great accessories that make or break a play house. Too small and you will be very limited in what you can do. While I haven’t added every idea to our cubby as yet, I am done for now. When interest wanes and something new is required, I’ll get back to the doorbell, letterbox and other items. 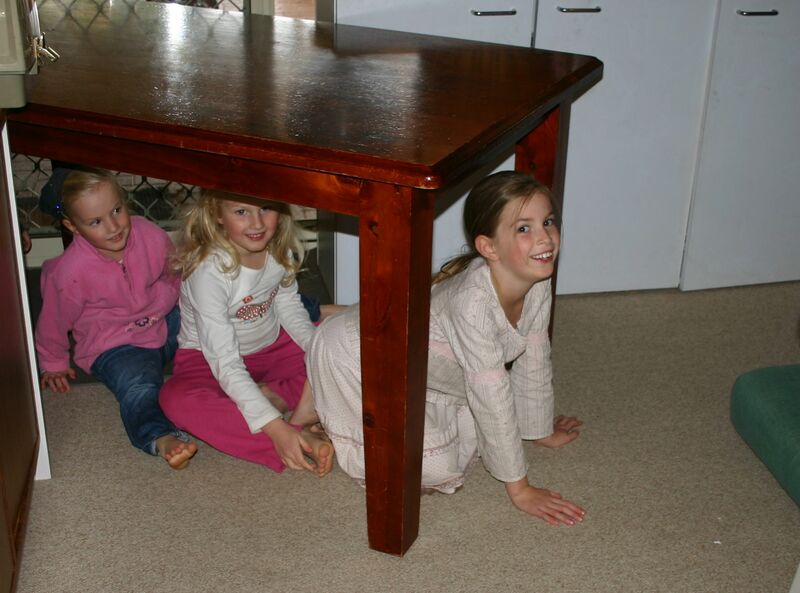 What great ideas do you have to make your cubbyhouse a great place to play? With a new baby on the way and wet weather kicking in, some plans for rainy day activities have become my priority. I have used mini sensory tubs in the past with great success as individual activities, but this time I want to keep several little people busy at once. After trawling the web and building up an inspiring Pinterest list of ideas, the last step in the plan was to find a suitable container. 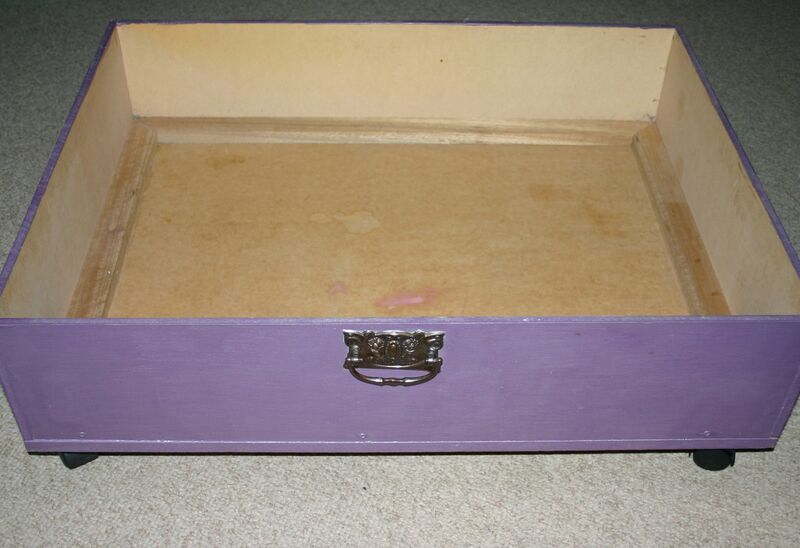 While a large, shallow plastic tub will certainly do the trick, as will a scrubbed out water play table, I was lucky enough to find a secondhand wooden under-bed drawer that is ideal. It is on castors so I can push it to wherever we want to use it and then simply cover it up and roll it back under the gamesroom table to get it out of the way. Being wood, it is also strong enough that if the children lean on the sides it won’t break. After raiding the pantry for some oats as the first play experience, I fished through the cupboard for suitable play accessories. Bowls, trays, scoops, tongs, measuring cups, ladles and jugs were laid out in an “invitation to play” as I have recently heard it termed. (Basically just placing materials in a way that attracts children to the activity.) I know some people don’t like to use food as play because they feel that it is wasteful, but I do keep my basic manipulatives (rice, oats, pasta etc.) and reuse them over and over again. I have rice in a container in the cupboard that has probably been used for 7 or 8 years now. Initially all 6 children were excited to play (Yes, even the 11-year-old boy!) so I added some extra accessories (jars with clip lids, plates, jugs and teacups) to cope with the numbers. This turned out to be a little difficult to manage however and with friction developing (read bickering, arguing and annoying each other) I directed the older three to go and find another activity and leave the younger three in peace. This was a much more amicable arrangement and much baking, cooking and food preparation was enjoyed for almost an hour in total. Of course the 2 clip-lid jars turned out to be the favourite accessory so some patience and sharing practise was required! (Why is there always one item that everyone wants?) Note that his hand is firmly attached to the top and I don’t think was removed for more than a second at a time to ensure that nobody else got hold of the jar! Tongs are such great practise for fine motor skills and help develop finger strength for pencil grip later on. The one rule I made before we started playing was that the oats and containers had to stay in the tray, not on the sheet. This did require some reminding when all 6 were playing as there wasn’t enough room for them to spread out everything they wanted to do, but once three children were using the sensory tub I only needed to remind the youngest a couple of times to keep the oats inside. Any deliberate spilling would mean that the offending child was done with the activity. I cover the box with a large sheet when it is not in use and it is this same sheet which is spread on the floor to catch any accidental spills. 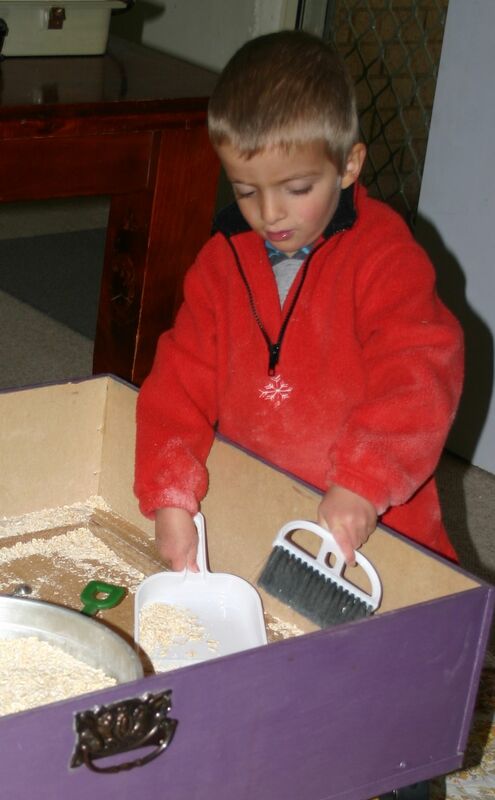 When play is finished, I roll the box off and pick up the sheet by the 4 corners, simply tipping the spilled oats back into the tub. There were a few strays left behind but as we have a new vacuum cleaner it was quite a novelty for the little boys to fight over take turns cleaning up the couple of oats that got away. On hard floors a quick swish with the dustpan would have done the job. I can see hours of fun ahead throughout the winter season and we will keep this as a special rainy day only activity. I plan to change the accessories every week or so to keep interest up (leaving the oats in place) and completely change the entire contents about every month. With the amount of ideas I have listed for items to add to a sensory tub, I have enough to keep going for years! What are your favourite rainy day activities? Oh the things you can do with a box! We had a new oven delivered last week after ours decided to stop working a while back and of course the most exciting part about that was the box! When you get the chance to keep one of those extra-large cardboard boxes, grab them and marvel at the entertainment it will give your children. Make a fast food van, cardboard box train, playhouse, aeroplane or a cave of stars. sail a viking ship perhaps? I saw the idea of using masking tape to make vehicle tracks a while ago and have since seen many people’s examples. Some have the tape going up and over chairs, mats, couches and all through the house. All you need is a roll of masking tape and some cars to drive on it. Let your imagination go wild as you design roads all over the place or in a more civilised fashion in just the one room. We added our wooden construction blocks for houses, bridges and buildings but you really don’t need to have anything like this, the tape alone is interesting. 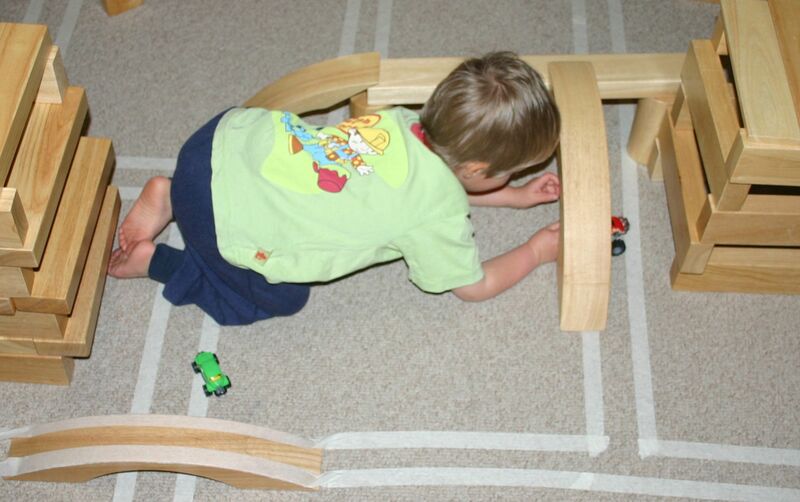 Allow your budding builders to design the layout with you and they will be hooked. Apart from the visual display, there is nothing to trip over so the roads can be left out indefinitely. Having said that, after a long time masking tape does get a bit trickier to get off. We played it safe and pulled ours off in under a week but I’m sure it would have been fine for longer than that. This is a great activity for a rainy day or during quiet time when younger siblings are napping, or perhaps younger children could play while older siblings are being homeschooled. We did it as a family activity with all the children together and constructed a whole city. The younger children returned to it over and over again in the next couple of days and were disappointed that we had to take it off. We will definitely use this again another day.